Andrew Dadson is a Canadian contemporary artist who explores abstraction in various media including painting, performance, photography and works on paper. Born in 1980 in White Rock, Dadson earned his BFA from Emily Carr Institute of Art and Design in 2003. In his oeuvre Vancouver-based artist consistently engages with the notion of boundaries in relation to space and time. Fascinated with the monochrome, a genre that has a long and lauded history, Andrew Dadson crosses, blurs, and questions the traditional limits of the canvas. 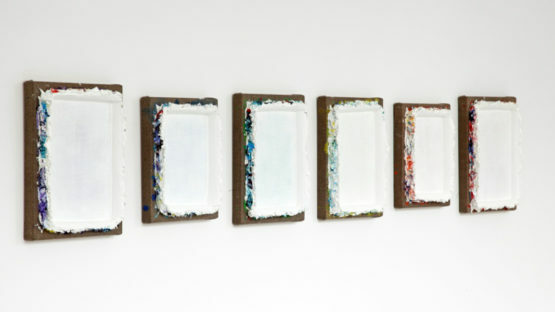 His practice is distinguished by his thick handling of paint, often beginning with undercoats of bright colors and leading to topcoats of black or white. These layers are scraped, pushed, and dragged, then piled on again, creating specific work that questions the beginning and the end of the boundaries. 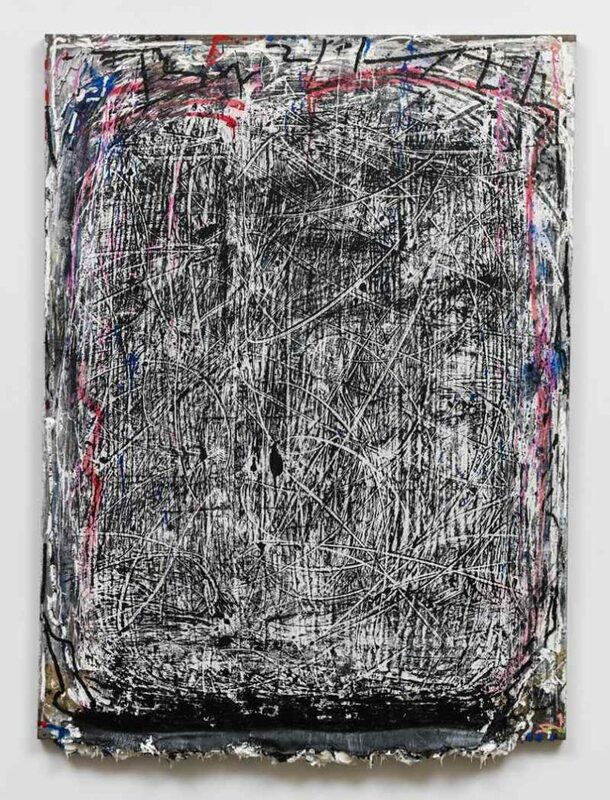 The pieces in Dadson’s ongoing series Re-stretched are created by scraping layers of paint toward each of the four edges of a canvas. When the paint dries, Dadson removes the canvas from the stretcher and mounts it on a larger frame, such that the excess paint forms a ridge in relief. On that way, the untouched linen that was stapled to the back of the stretcher becomes visible, and it pushes the thick band of paint that had accumulated at the edges onto the front of the composition, such that they become almost like sculptures. In one of the pieces from the Re-stretched series, White/ Red/ Orange/ Yellow/ Green/ Blue/ Purple/ Pink Re-stretched, each canvas has a different base color visible through the material that covers them so the optical aspect of painting is fused to its physicality. Andrew Dadson is best known for his landscape paintings which are actually photographs of landscapes he’s painted. 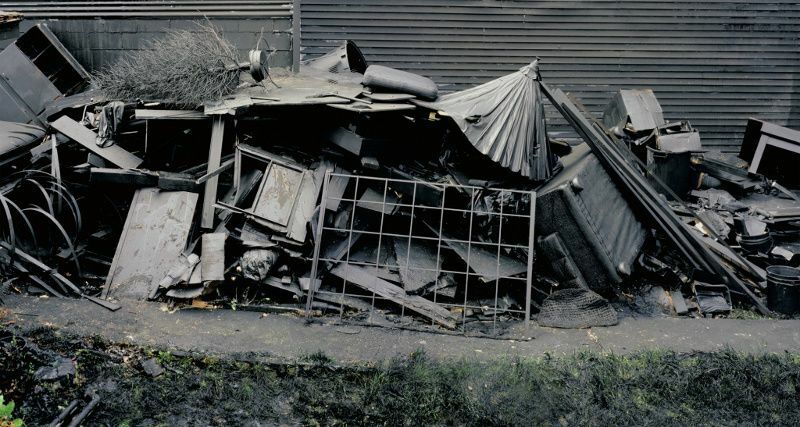 His landscapes are the many nondescript, weed- and grass-covered hillsides in forgotten suburban areas painted with dark colours and then photographed. Non-toxic, edible paint is usually washed away in a couple of days. Andrew is interested in time and how the overlay of a monochrome on the landscape disappears quite quickly, reverting to its previous state. Dadson does his landscape interventions without getting any permits. In his Lawn and Yard paintings Andrew transforms patches of outdoor space into monochrome squares with all objects found there, including grass, bushes, walls, fences and lost objects — persistently painted with plant-based colours. Dadson is interested in nature’s ability to survive his assault, and his works attest to plurality and the complexity of life. 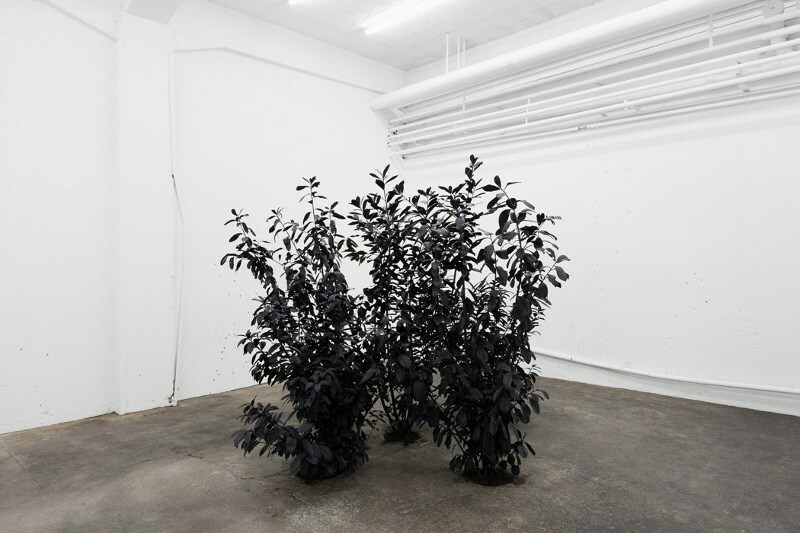 In 2013 Andrew Dadson showed his painted vegetation in a gallery, planted directly into the gallery floor, and thus as sculpture rather than as photographic evidence. The exhibition entitled Paint Pour was held at RaebervonStenglin in Zurich. Nurtured with water and light, the plants gradually grew through the black paint in which the artist had dyed them, ultimately eliminating his efforts. 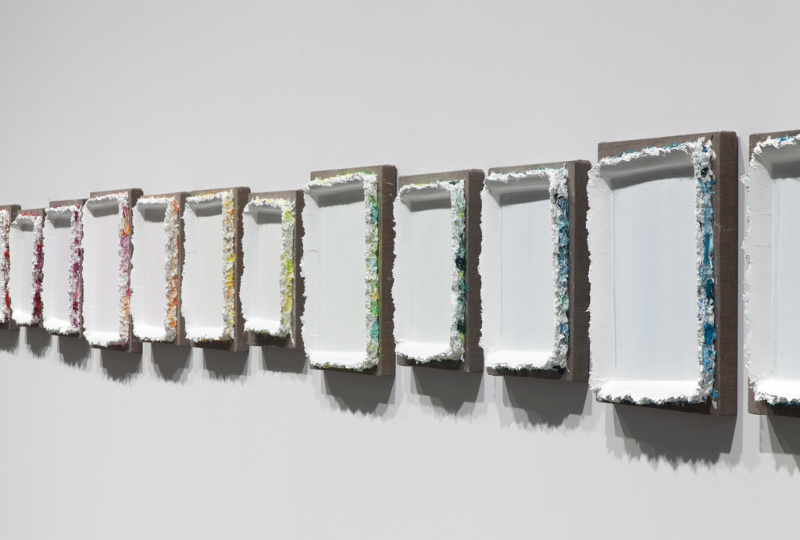 The title Paint Pour refers to the Glue Pour works which American artist Robert Smithson made directly onto land in Vancouver in 1969. In 2008 Andrew Dadson published his first book, Visible Heavens based around a star map from 1850. The original map was photocopied, and each next copy was re-photocopied 158 times until the final page, which is entirely black. Visible Heavens symbolizes the shift within our interpretation of the stars and each photocopy represents a year in the fall from “heaven to earth.” The map changes from an accurate vision of the stars above to an abstracted blackness depicting the new “heaven” in the year when the book was published. Since his first solo exhibition at the Helen Pitt Gallery, Vancouver, in the year of his graduation, Andrew Dadson has exhibited in solo and group exhibitions in Canada and internationally, in France, Germany, Italy, Belgium, Switzerland and the United States. Andrew was the 2011 recipient of The Brink Award, a biennial prize presented to an emerging artist whose practice shows great artistic promise working in Washington, Oregon or British Columbia. Dadson is represented by Galleria Franco Noero, Turin, Italy and David Kordansky Gallery, Los Angeles, USA.